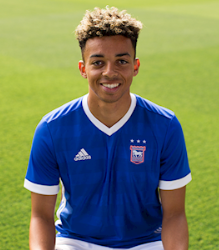 Ipswich Town teenage sensation Ben Folami has chosen to represent Australia over Nigeria at international level. Born in Sydney, Australia to a Nigerian father, the 19-year-old striker is eligible for either countries but has revealed that he is committed to the Asian Football Confederation powerhouse. Folami has taken his first steps towards becoming cap-tied to the Socceroos after he was named in the final Australia U19 squad for the ongoing 2018 AFC U-19 Championship in Indonesia. He was handed his full competitive debut for Australia U19s in their 1-1 draw with Korea Republic on Friday, October 19, playing for 76 minutes before he was substituted. Speaking to News.com.au last month Folami said : ''I’m committed to playing for Australia. It’s the only country I’ve ever wanted to play for. ''I back myself to do well (with the Young Socceroos) because of everything I’ve done in England''. Folami joined Ipswich Town in 2016 and has made five first-team appearances to date, logging 238 minutes. Bernie Ibini-Isei and his sister, Princess have played for Australia's senior team after earning multiple caps for their youth teams.